Spaghetti the most famous format born in the South of Italy and in the cities with the greatest concentration of pasta factories: Naples, Genoa and Liguria in general. The Spaghetto is a long rod pasta format with a round section with a diameter ranging between 1,92 and 2,00 mm. Historically the first ufficial evidence of the name "spaghetto" goes back to 1819 on the pages of the first Italian dictionary by Nicolò Tommaseo and Bernardo Bellini. This is how the definition starts off "singular masculin, diminutive of spago (thread)" and with a mention to the "Spaghetti soup": as thick as a thread of spago and as long as sopracapellini". In 1957 BBC broadcasts the first scientific documentary on their production. The following day BBC phone lines were chcked up with phone calls of people asking for more information on spaghetti producers and distributer in order to buy them. Spaghetti can be served with fresh or canned tomato warm or cold sauces with vegetables and aromatic herbs. Also excellent with quick hot spicy sauces with garlic and Cayen pepper. Also perfect Fish sauces with shellfish and fruit de mer, "white" sauces made with milk cream, mascarpone, soft and melted cheeses, adding spices such as saffron, radish curry and ginger. Pasta Fusilli n° 34 500 gr. 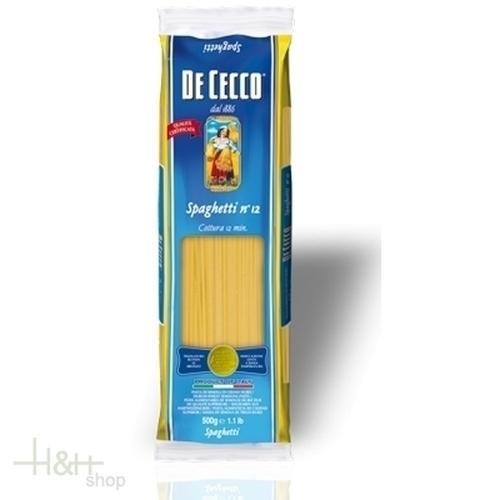 - De Cecco 1,90 EUR / 3,80 €/kg. Pasta with Egg Fettuccine 250 gr. - Spinosi 5,70 EUR / 2,28 €/100 gr. Homemade Pasta made durum wheat semolina - Conchiglie 500 gr. - Pasta Callari 3,45 EUR / 0,69 €/100 gr. Organic Pasta Linguine 500 gr. - La Motticella - Paolo Petrilli 5,70 EUR / 11,40 €/kg.